Housing Market Continues to Crash on High Volume! The Signs of a Market Top? A Hidden $34 Billion Bank Subsidy? If eligible, you may borrow between $20 and your available credit limit. If your checking account is overdrawn, you must borrow enough to bring your checking account balance to a least a $0 balance. The finance charge is $2 for every $20 borrowed. This is an Annual Percentage Rate (APR) of 120%. It all started with a mistake I made this week. My property tax bill is coming up and although I had plenty in my checking account to cover it, I opted to transfer a bit more money over from an online account at another bank as an extra buffer. Call me paranoid but I don't like running with low balances. All it takes is one excess banking fee to turn free checking into something quite expensive. Being one of those careful double-checking types, I called my bank's automated system today to see how much money I had available before cutting the property tax check. It was FAR less than I knew it should be. It took me all of 5 seconds to figure out what I had done. I mistakenly transferred the money the wrong way! Rather than put additional money in to serve as a buffer, I actually yanked out my previous buffer and a whole lot more. D'oh! This brought me to the next startling fright. It is the Halloween season and more tricks were clearly on the way. My balance should be negative. If not now, it soon will be. I then called customer service and asked what my options were. I've never actually had a check bounce and figured there might still be time to head it off. He offered me $500 at a 120% annual interest rate. Gee, thanks! With friends like that, who needs enemies? Another option he offered was to do nothing and let the fees pile up as checks began to bounce (he worded it in a much friendlier way). I ended that conversation and decided to dig further on why my account actually was not negative already. Maybe I could hit the problem from the other end. That's where TIPS came in. Thank you US Government. You deposited interest in my checking account on October 15th (one day after the period my last bank statement covered). Saved by a timing miracle! I'm not completely out of the woods yet, but at least I have more control over where this goes. At least I won't be bouncing checks. Whew! I immediately transferred more money from my online account to my brick and mortar bank. Time is not on my side though. The property tax check must be postmarked by October 31st. I'm hoping that I can see the money show up in my US Bank account by Saturday AND get confirmation from my bank that they won't put a hold on the funds. I'm fairly confident I can get the latter if I arrive in person and explain it. I've had some practice at it over the years (mostly when moving money to buy I-Bonds). Persistence and a good credit record goes a long way. I may need to pay my property taxes late though, depending on how it goes. I'm certainly not guaranteed success. Regardless, it is far better than bouncing checks and/or paying 120% interest rates though. Paying a month late should cost me just over $30. I'm hoping it doesn't come to that, but at least I miraculously managed to fend off at least some of the pain (blind luck). And lastly, I want to point you to something my bank statement used to say on it (but says no longer). What happened to our relationship? Was it something I said? Why are you offering me 120% interest rate loans? You seem so cold and distant these days. I am once again reminded of the economic pain that millions of people go through each and every month in this country. I had money but simply had it in the wrong place. There are many who simply don't have the money at all. The banking system is there for them, much like the loan sharks of the past. As Cobleigh explains, "The real aim of loan sharks is to keep their customers eternally in debt so that interest (for the sharks) becomes almost an annuity." The entire article is a must read this week. Every party ends sooner or later, and I see two scenarios for the next bust. First, every trader is borrowing dollars to buy something else. Most traders on Wall Street are Americans, British or Australians. They know the United States well. The Fed is keeping interest rates at zero, and the U.S. government is supporting a weak dollar to boost U.S. exports. You don't need to be a genius to know that the U.S. government is helping you borrow dollars for speculating in something else. But these traders don't know much about other countries, particularly emerging economies. They go there once or twice a year, chaperoned by U.S. investment banks eager to sell something. They want to think everything other than the U.S. dollar will appreciate; Wall Street banks tell them so. Since there are so many of these traders, their predictions are self-fulfilling in the short-term. For example, since the Australian dollar has appreciated by 35 percent from the bottom, they now feel very smart while sitting on massive paper profits. When a trade like this one becomes too crowded, a small shock is enough to trigger a hurricane. There must be massive leverage in many positions, but one just never knows where. When something happens, all these traders will run like mad for the exit, and that could lead to another crisis. I once again point out that toilet paper prices are not confirming the "sure things" (be it foreign currencies, high income bond funds, gold, oil, or commodities in general). I also want to point you to an actual concrete example of the speculation mindset. It's taken from a message board I often frequent (since I own the fund). My first reaction to it was that it didn't sound like such a bad plan. TIP is up over 7% YTD which is a pretty darned good return for "super safe". It therefore doesn't surprise me that some would wish to take profits and exit. I'm certainly tempted (especially since posting my stock market topping thoughts last Friday). However, that was not the thinking. In fact, it was the exact opposite thinking. 7% simply wasn't good enough. I know rationalization when I see it and THAT is it. Would someone who is easily "spooked" knowingly and willingly rush to a fund investing in the following? Investing in companies in troubled or uncertain financial condition. It's taken straight from the fund's description on Fidelity's website. Let's sum up the fund's holdings by credit rating. Lower-quality bonds can be more volatile and have greater risk of default than higher-quality bonds. Floating rate loans may not be fully collateralized and therefore may decline significantly in value. Fixed income investments entail interest rate risk (as interest rates rise bond prices usually fall), the risk of issuer default, issuer credit risk and inflation risk. Foreign securities are subject to interest rate, currency exchange rate, economic, and political risks. All that risk for just an expected 3.62% nominal return (4.35% 30-Day Yield - 0.73% expenses). Halloween is just a few days away? How's that for spooky? Let's start with the concept of borrowing money we don't have to fund programs which will eventually eliminate up to 47,000 jobs long-term. Surely that will help our economy. Right? Meter reading is one of the fastest-declining occupations, as a result of automated meter reading (AMR) systems that allow meters to be monitored and billed from a central point. Meter readers held about 47,000 jobs in 2006. Itron was on CNBC today. Although their production is fully automated (the robotic arms are amazing), the company said they will be hiring 100 employees to help meet the demand of their products. You heard me right. 100 employees will be hired. Itron does indeed have "significant skin in the stimulus-funded game". It isn't human skin though. It's robotic skin. In August of this year Itron announced an additional automated production line at its production facility in West Union, South Carolina. This new production line utilizes advanced next-generation robotic technology that enables quality production of this smart grid equipment. The new automation ensures that Itron can meet expected demand for both current contracts and future awards. Furthermore, in the spirit of the Stimulus objectives outlined by the Obama administration, this location, as well as Itron`s other facilities throughout the United States, continues to create new jobs and economic opportunity for recovery with domestic manufacturing capacity that fully complies with the American Recovery and Reinvestment Act`s "Buy American" requirements. I'm not suggesting that automation is a bad thing. I'm simply attempting to show the reality of what is going on. The more jobs that are automated and/or outsourced, the fewer jobs will be left. We already saw this in the farming industry. In science fiction, automation often shows a worker with little to do in a somewhat utopian environment. This is not science fiction though. Workers with little to do these days can't actually afford to buy a house and/or pay down years of accumulated debt. In sharp contrast, they are currently sitting at home collecting unemployment checks at a fraction of what they would normally be paid. Another view that capitalist utopias do not address is the issue of market failure, any more than socialist utopias address the issue of planning failure. Thus a blend of socialism and capitalism is seen by some as the type of economy in a utopia. We've been combining the very best of capitalist market failure and socialist planning failure for at least a decade so far. Just look at the results. Jetsons or Lost in Space? You make the call. William Pesek is pointing out problems again. Yep, another week has passed. David Einhorn was right about Lehman Brothers being a house of cards. What about Japan? The New York-based hedge-fund manager who bet against Lehman Brothers says, “It is hard to see how Japan could avoid a government default or hyperinflationary currency death spiral” once borrowing costs increase. Lehman was one thing; Japan crashing is too frightening to contemplate. Einhorn’s firm, Greenlight Capital, has bought options that anticipate much higher interest rates. He is betting on a phenomenon many tried to time for a decade: a meltdown in a bond market with irrationally low yields. We're very much following in Japan's footsteps. Based on how much we're borrowing to fund these never ending recoveries (two stock market crashes and one housing market crash just nine years into the new century), I'd say that in 10 years we should be where Japan is now. We seem to be the lemmings of the financial world. Will we continue to walk in Japan's footsteps once they walk off the cliff? Will the global economy allow us to keep on that path if Japan's "too frightening to contemplate" becomes way too real to ignore? With so much money readily available for investment, speculation was inevitable, particularly in the Tokyo Stock Exchange and the real estate market. The Nikkei stock index hit its all-time high on December 29, 1989 when it reached an intra-day high of 38,957.44 before closing at 38,915.87. Additionally, banks granted increasingly risky loans. My bearishness is not measured in days, weeks, or months, or even years. It is measured in decades. Japan has been struggling for two decades so far. We're just one decade behind them. After jumping 9.4 percent in September, home resales are up nearly 24 percent from the bottom in January, the National Association of Realtors said Friday. That certainly covers the "high volume" part of my alarmist headline. The median sales price last month was $174,900, down almost 9 percent from $191,200 a year earlier, and slightly lower than August's median of $177,300. The median sales price fell 1.35% in just one month. That's a 17% annualized rate of fall. That certainly covers the "continues to crash" part of my alarmist headline. By not even attempting to sugarcoat the news, I clearly continue to ruin my chances of ever landing the Chief Economist position at the National Association of Realtors. Oh well! The following is a theory that I told the guy who cuts my hair a few years ago. As a contrarian, I believe the market likes to do the opposite thing that most people expect or think is sure to happen. If it didn't, all day traders would be filthy rich by now. A 2000 study by the North American Securities Administrators Association, quoted in Forbes, found that "77 percent of day traders lose money. And of those who did profit, the average was just $22,000 over the space of eight months. Of the 124 accounts surveyed, only two—people, not percent—netted $100,000 or better. The highest was $160,000." And that was at a time (1998-1999) when the stock market was soaring. Now that it has come back down, there is even less money being made. Bull markets are started when bad news drives stocks higher. At some point the never ending bad news exhausts all sellers and the investors who are left become desensitized to any further bad news. Once the selling stops, the market can rise. The market's rise eventually leads to higher investor confidence and therefore turns into a virtuous upward spiral. Bear markets are started when good news drives drives stocks lower. At some point the never ending good news exhausts all buyers and the investors who are left become desensitized to any further good news. Once the buying stops, the market can fall. The market's fall eventually leads to lower investor confidence and therefore turns into a vicious downward spiral. So what did we see today? I turned on the TV this morning and the bulls assured me that the market would in fact have to go up. The Microsoft and Amazon numbers were completely unexpected and would propel the market to higher highs. For all intents and purposes, it was a SURE THING! What did we actually get though? As I look at the intraday chart of the stock market today I see that we had about 30 minutes of bull market and then the buyers completely and utterly dried up. Even Amazon's 25% increase in stock price could not support the market overall. The following question was asked repeatedly on CNBC today. Would Amazon's numbers be enough to save the economy? I laugh at the very thought and for a reason you might not suspect. There are 300+ million people in this country. According to Yahoo's profile of Amazon, there are just 20,700 employees working at Amazon. On Oct. 22, Amazon said third-quarter net income surged 68%, to $199 million, while revenue jumped 28%, to $5.45 billion, compared with Wall Street's estimate of $5 billion. That's roughly $260,000 in revenue per employee in just one quarter. It's a productivity miracle. Why should this be concerning? Let me put it this way. When I order something from Amazon.com I don't actually need to talk to an employee. Amazon.com therefore needs fewer employees than most retailers would. Fewer employees means fewer jobs. With unemployment at 10% and rising, fewer jobs means... big problems ahead. Let's put this in perspective. 2,100,000 employees work at Wal-Mart. 351,000 employees work at Target. 324,000 employees work at Sears. 167,000 employees work at Macy's. 147,000 employees work at J.C. Penney. Just 20,700 employees work at Amazon.com though. Employment is expected to grow by 12 percent over the 2006-16 decade, which is about as fast as the average for all occupations. In fact, due to the size of this occupation, retail salespersons will have one of the largest numbers of new jobs arise, about 557,000 over the projections decade. This growth reflects rising retail sales stemming from a growing population. Many retail establishments will continue to expand in size and number, leading to new retail sales positions. Since retail salespeople must be available to assist customers in person, this is not an occupation that will suffer negative effects from advancements in technology. To the contrary, software that integrates purchase transactions, inventory management, and purchasing has greatly changed retailing, but retail salespersons continue to be essential in dealing with customers. There will also be an increased demand for retail salespersons in warehouse clubs and supercenters, which sell a wide assortment of goods at low prices, since they continue to grow as many consumers prefer these stores. Despite the growing popularity of electronic commerce, the impact of electronic commerce on employment of retail salespersons is expected to be minimal. Internet sales have not decreased the need for retail salespersons. Retail stores commonly use an online presence to complement their in-store sales; there are a limited number of Internet-only apparel and specialty stores. Retail salespersons will remain important in assuring customers, providing specialized service, and increasing customer satisfaction. Most shoppers continue to prefer to make their purchases in stores, and growth of retail sales will continue to generate employment growth in various retail establishments. They can't be serious. Let's look at the actual numbers again using a crude back of envelope calculation. In 2008, Amazon's 20,700 employees generated roughly $19 billion in sales. In 2008, J.C. Penney's 147,000 employees generated roughly $19 billion in sales. Amazon.com was able to generate the exact same sales with 1/7th the number of employees. So what is going to happen to the overall retail sales employment picture as Amazon.com continues to grow? Does it really take a great leap of faith to realize that retail sales employment will struggle going forward? China and India share a dubious honour as the global crisis wanes: they are home to two of the world’s most obvious stock bubbles. Well, there you have it. He's done a great job navigating us through these treacherous economic times. I've quoted his words of wisdom many times on this blog. Ignore his current warning at your own peril. Happy hour is lasting a bit too long for comfort. If stocks are rallying because of economic fundamentals, then so be it. If they are rallying because of easy-money policies, then Asia’s stability is more fiction than fact. It’s time for monetary bartenders to start declaring closing time. You certainly know where I stand. It must frustrate the heck out of the Fed right now to know that deflation is still the imminent threat but people keep asking them about exit strategies. 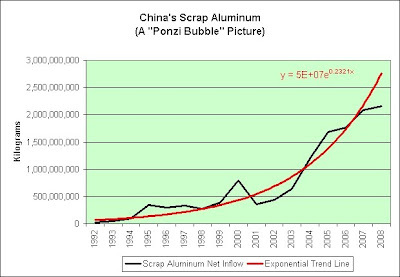 The following chart shows the net imports of aluminum scrap into China over the years. The exponential trend line shows a 23% average annual growth. 2.5 billion kilograms represents roughly one pound of aluminum scrap heading into China for every man, woman, and child on this planet. This is just the scrap aluminum though. It doesn't even count the aluminum that's being mined. The following chart shows what would happen if this trend continued to the year 2030. 450 billion kilograms of aluminum scrap would represent roughly 150 pounds for every man, woman, and child currently living on the planet. Looks like I better start drinking more canned soda pop to pull my fair share! Aluminum, used in homes, cars and drinks cans, has advanced 19 percent this year on the London Metal Exchange as China's 4 trillion yuan ($586 billion) stimulus package and state stockpiling increased imports to a record and as the world recovered from its worst recession since World War II. Once everyone has stockpiled, then who will be left to buy? 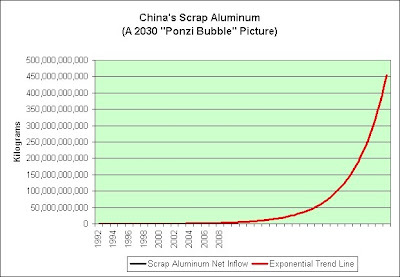 I've stockpiled a lot of aluminum foil over the years on the hopes that hindsight would someday show I was being silly (better being silly than being right during hyperinflation). I think that someday is quickly approaching. He expects the price of aluminum on the London Metal Exchange to drop to $1,500 a ton by the end of the year and the price on the Shanghai Futures Exchange to decrease to 13,500 yuan per ton. Despite a recent increase in inflation expectations from the bond market, 1.99% is still a far cry from what many gold bulls are expecting. Yet there's one important caveat - the bond market could end up right, which would likely be bad news for gold or any short position against treasuries. You know what they say about the market. It likes to inflict the maximum pain on the maximum number of people. The bond market could indeed be right. Maybe every farmer in China won't be flying in aluminum planes in the coming years. In sharp contrast, perhaps we'll actually still be fighting deflation (much like the Japanese have been doing unsuccessfully for decades). If so, the pain I experience by hoarding a bit too much aluminum foil will be dwarfed by the pain felt by investors of today who backed up the truck on commodities at these prices. Something is happening that Adolf Hitler does not yet understand—a new re-enactment of the old American miracle of wheels and machinery, but on a new scale. This time it is a miracle of war production, and its miracle-worker is the automobile industry. Even the American people do not appreciate the miracle, because it is too big for the eye to see in an hour, a day or a month. It is, in fact, too big to be described. It can only be understood by taking a sample. Worst housing shortage is at Detroit. With Ford's Willow Run bomber plant nearly ready for 70,000 workers, there are virtually no houses near the plant and it is almost impossible to rent a house in Detroit, 25 miles away. Now plans are afoot for 45,000 new dwellings in the Detroit area but pipe for water lines is still lacking. 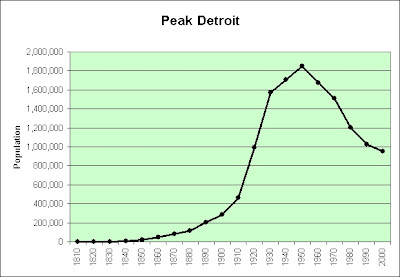 And by year's end Detroit must house 190,000 more war workers. As GM Goes, So Goes the Country. Still Valid? If it's still true that the country mirrors GM, we're having our collective asses handed to us on plates in the form of Toyota wheel covers. To most, that seems OK. Is it? This is just a handful of the photos I have of such places. I have dozens more (the lighting conditions were fairly similar in this selection taken over the course of three summers). Among the abandoned houses of Detroit, the lucky ones aren't burned completely or bulldozed, but allowed to be consumed by the foliage once meant to beautify them. This is something that has obviously been fascinating me lately. We might see ghosts of lives lived well within these walls, sentimentalize the structures and feel sad that they have been allowed to go wild. . . Mere words cannot do the photos within the link justice. – 2,310,984 prisoners were held in federal or state prisons or in local jails – an increase of 0.8% from yearend 2007, less than the average annual growth of 2.4% from 2000-2007. 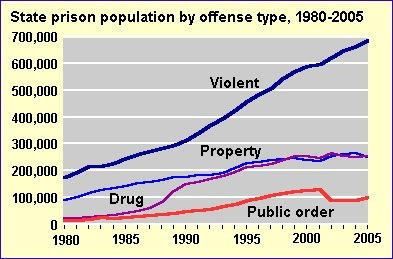 Keep in mind that prison population is growing much faster than the population as a whole. Also keep in mind that 2.3 million prisoners are not considered unemployed. They are technically not working at the present time but they are also not able to work at the present time. There are 15.1 million unemployed people in this country. I might be a bit biased (since my girlfriend is unemployed and I have too in the past), but I think it is a good idea that the government is willing to extend unemployment benefits. Poll question: Would you steal food to feed your family? The blue line is for the optimists. The exponential trend line simply reflects a return to business as normal. 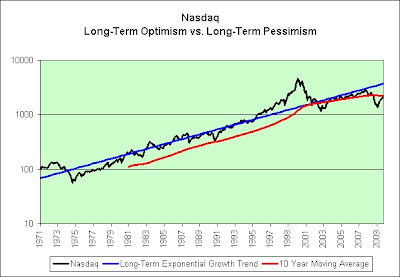 As seen in the following link, the Nasdaq is still firmly convinced that the Nasdaq is a good investment long-term. Despite the recent devastating global bear market, there is no doubt in my mind that we are simply going through another cycle. Mind you, I did not say just another cycle. This cycle has been extraordinary. Right now, the overwhelming belief is that equities are dead. Even during the most powerful rally in more than 70 years—nearly a 40% rally off the March 2009 low—most believe that this is nothing more than a bear market rally. The red line is for the pessimists. In spite of the "most powerful rally in more than 70 years" the 10-year moving average is continuing to roll over. Go figure. Consider the dividend yield -- the annual dividend divided by stock price. The yield for the Dow Jones Industrial Average has fallen from 4.7% on March 9 to 2.95%, about the same as in September 1929 -- and lower than at all other stock-market peaks of the 20th century, writes Prechter in his most recent report. With the dividend yield so low, "people are too optimistic about making capital gains," Prechter says. "When dividend yields are low, it has always indicated a market top," he adds. But that isn't all that gives Prechter pause. At the end of July, mutual-fund cash holdings stood at 4.2% of assets, not much higher than the all-time low of 3.5% at the July 2007 stock-market high. Moreover, sentiment readings have gone bullishly haywire -- a notably contrarian signal. Prechter, who predicted both last year's major decline and the 1987 crash, and who is issuing an updated version of his 2002 Conquer the Crash later this month, notes that the Daily Sentiment Index reported by MBH Commodities recently hit 92% bullish, compared with just 2% at the March low. I'd like to think that I'm neither an optimist nor a pessimist. That said, I'm leaning very heavily towards the pessimist arguments. It certainly wasn't the "overwhelming belief is that equities are dead" that managed to rally the stock market the most in 70+ years. I can tell you that much. Somewhere, someone must have believed. It surely wasn't me. In fact, it's the only thing that prevents me from investing much of my money in hard assets right now. I respect the damage that yet another deflationary downleg could do. I've been riding the inflationary/deflationary fence since 2004. No complaints so far! Have I been too pessimistic? Hindsight says otherwise. If anything, I've been consistently too optimistic. I thought our economy would experience serious pain, but the pain that appeared has exceeded my expectations (as seen in the nearly 10% unemployment and rising if nothing else). My central point is that the global economy is cruising toward mild stagflation with a 2 percent growth rate and 4 percent inflation rate. This scenario is the best that the central banks can hope to achieve; it combines an acceptable combination of financial stability, growth and inflation. But this equilibrium is balanced on a pinhead. It requires central banks to constantly manage expectations. The world could easily fall into hyperinflation or deflation if one major central bank makes a significant mistake. I believe with 100% conviction that this is indeed the best scenario that central banks can hope to achieve. The bottom line is that, regardless what central banks say and do, the world will be awash in a lot more money after the crisis than before -- money that will lead to inflation. Even though all central banks talk about being tough on inflation now, they are unlikely to act tough. After a debt bubble bursts, there are two effective options for deleveraging: bankruptcy or inflation. Government actions over the past year show they cannot accept the first option. The second is likely. 1. We can officially declare national bankruptcy. This would take a VERY brave set of politicians. I am 100% convinced we don't have many left. Can you imagine one of the politicians actually standing up in front of all of us and saying that we spent all of OUR money bailing out the banking system but there isn't anything left for the rest of us? We're now going bankrupt? Oh yeah, I can sure picture that. NOT! 2. We can allow inflation to silently erode our debts. This does not take any VERY brave politicians. It can happen behind closed doors using a monetary printing press that can print them "at essentially no cost". In fact, it has already happened. Long-term, my money is firmly on #2. That's the you-know-what that will be hitting the fan in my opinion. Hyperinflation was used in Germany in the 1920s and Russia in late 1990s to wipe slates clean. The technique was essentially mass default by debtors. But robbing savers en masse has serious political consequences. Existing governments, at least, will fall. Most governments would rather find another way out. Mild stagflation is probably the best one can hope for after a debt bubble. A benefit is that stagflation can spread the pain over many years. A downside is that the pain lingers. Gold and oil prices continue to confirm the long-term theory. Both are far more expensive than when I turned bearish in 2004. I rode some of that action from 2004 to 2006, but now sit entirely in inflation protected TIPS and I-Bonds. I think at least some stagflation will arrive at some point and it may linger for MANY years, perhaps even the rest of my life. We've ridden a long-term deflationary wave by outsourcing our manufacturing to the rest of the world (China in particular). I believe that wave is coming to an end for the most part. "Made in USA" is now pretty much a relic. There just isn't that much manufacturing left to outsource. How much do I believe in the long-term stagflation theory? Let me simply share an example. I bought a new Swing-A-Way can opener (great product!) at about the same time I turned bearish in 2004. It was "Made in USA" at the time. Although it continues to work fine I know that it is only a matter of time before rust and/or a dull blade eventually takes their toll. As part of my "hoard future needs now" mindset I therefore opted to buy another and tuck it away. When I saw that it was now "Made in China" I actually decided to buy two. I could be wrong, but I just don't see products made in China getting all that much cheaper over the long-term (especially if oil keeps rising in price). We keep sending them paper money and they keep sending us real goods. If that isn't sustainable long-term (which I strongly suspect it isn't), then it would stand to reason that prices are going to go up long-term. Are you too old for stocks? The bear market caught a lot of retirement investors too exposed to stocks, but shying away now could mean missing a rally. The Nasdaq is up a whopping 66% from the bottom set in March. We're now told we might miss a rally if we don't invest now? Hahaha! How you should proceed depends on your age. At 45, the only way I'd put money back to work in the stock market at these prices is if sharks with frickin' laser beams were pointed at my head. Our research has shown with stocks, including in 2008, that there has never been a 15-year period where average stock returns were negative. So we still think stocks are an important part of the portfolio. My research has shown with United States trade, including in 2009, that there has never been a 15-year period where this or this has happened. My research has shown with United States budget deficits, including in 2009, that there has never been a 15-year period where this or this has happened. My research has shown with United States oil production, including in 2009, that there has never been a 40-year period where this has happened. So I still think owning this is an important part of my portfolio. So we have a lot of people that will get very upset about money going to foreign aid, money going to needy families, thinking that that might not be a good expenditure, but the point here is we’re giving much more money to Goldman Sachs and Citigroup, Bank of America, than we are to foreign aid or to needy families. Image created by yours truly at Says-It.com. My own suspicion is that we’re going to penetrate the 10 percent barrier and stay there for a while before we start down. Although unemployment is currently at 9.83% and rising, Alan Greenspan suspects that it may actually reach 10.00% or more. I know. Sounds pretty far-fetched. Keep in mind he only suspects it though. At some point we’re going to start to see an improvement in employment. Although he can't say exactly when unemployment will peak or at what level it will peak at, he can say that we should see improvements in employment once it does peak. Amazing! Watch out Miss Cleo. There's a new fortune teller in town. Here's a glimpse showing where the big money is moving (as seen in the "Top 10 by Size" section). Stagflationary thoughts... they aren't just for breakfast any longer. On the other hand, the markets can't inflict the maximum pain on the maximum number of investors without first properly aligning the maximum number of investors. In other words, just because the trend has been consistent, past performance is no guarantee of future returns. Take my inflation protected TIP fund for instance (seen above). The distribution for October came in at just $0.04744 per share but the fund closed the day at $102.97 (above its long-term trend). In order to justify the current price, there better not be any more deflation. I am comfortable in TIP long-term but... we are heading into Christmas with rising (and extremely high) unemployment. More deflation is a distinct possibility. As you may know, gold has become way too rich for my blood and have said as much on my blog in recent months. I have no interest in owning gold at these levels. That said, I could very well be wrong to think this way. I do have "stagflationary" in my name after all. Therefore, to the delight of the gold bugs I thought I'd play contrarian today. That brings us to the fantasy half of the equation, which seems to be the main driver of gold today. Gold is the asset class of choice for those who fear grim tidings ahead. A collapse in the dollar. Runaway inflation. Civic upheaval. Some gold bugs talk of stockpiling seeds, bullets and canned goods. It can get a little Area 51. Although you can't see it all in the picture, you'd have to agree that it can't be more than 10% of Area 51. In other words, it's at best a "little Area 51". Get it? Hahaha! I crack me up sometimes. Sorry about that. I don't expect a complete collapse of the dollar or runaway inflation, but I am somewhat braced for higher long-term inflation than the bond market is (just 1.7% inflation expected over the next 10 years as seen in the difference between 10 Year Treasuries and 10 Year TIPS). Much of what you see in the picture has outperformed the stock market since 2000. I think there's a decent chance it will continue (even if we enter a deflationary spiral). That's all. 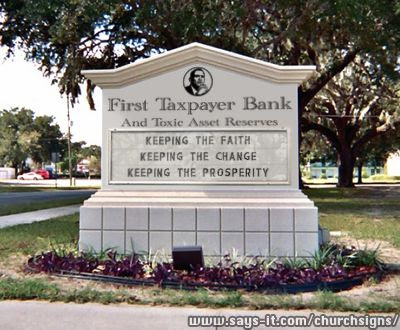 I'm just not much of a believer that we can borrow our way back to prosperity. Civic upheaval? Despite the acoustic device battles with protestors in Pittsburgh during the G-20 meetings, the notion of collapsing civic order seems increasingly far-fetched. How can anyone argue that it is becoming increasingly far-fetched? As unemployment approaches 100%, collapsing civic order approaches 100%. That's the math as I see it. Therefore, let's reserve "increasingly far-fetched" for the point in time when unemployment actually starts to fall. Until that time, I'll be taking extra special care when using the ATM at my local bank (especially once it gets dark). Let's just put it that way. So, if gold is a lousy investment then what would Barron's suggest is a good investment? Glad you asked! For inflation, investors would be better served investing in Treasury inflation-protected securities, or TIPS. The risk of TIPS declining dramatically and becoming dead money for decades is exceedingly remote. Moreover, even if inflation doesn't surge, TIPS can still be a good store of wealth, while gold could do just the opposite. Most of my nest egg sits in TIPS. What is said is all fine and dandy, but TIPS can only provide limited inflation protection. TIPS investors have to pay tax on the inflationary gains as they appear. Those taxes can really start to hurt if inflation picks up. Investing in TIPS is kind of like buying fire insurance for your house that refuses to pay if the house completely burns down. So are TIPS investors such as myself really better served? Only hindsight will know for sure. I can say this though. Inflation better not get too far out of hand or TIPS will financially ruin me. That's a risk I'm willing to take. It is a risk though. So what else does Barron's suggest we invest in if gold is lousy? What's not to like? It's got both California AND the restaurant industry? Oh joy! We also think a moderation in home price declines since early 2009 offers a glimmer of optimism for restaurant companies with heavy California exposure, and California Pizza Kitchen in particular as 40% of the company's sales are attributed to the Golden State. A glimmer of optimism? Oh my. Sign me up. To be fair, I'm seriously underwater on my anti California Pizza Kitchen play so far. That glimmer of optimism seems to have transformed into something much larger than that based on the stock market's recent performance. I'm letting that imaginary money ride though. That's right. I'm a glutton for imaginary punishment! I'll be tracking California Pizza Kitchen in the years to come. I've been watching California's economy. I've been watching the restaurant business. I'm ashamed of myself for not thinking of it sooner. The risk as I see it depends on whether this is a cyclical downturn or a secular downturn. I didn't start a blog based on the former, but I could be wrong of course. This isn't from some obscure survivalist website. It is located right on Costco's starting web page. There you have it. Our monetary and fiscal polices are getting people to shop again. Splendid. If this isn't an example of moving future demand into the present I don't know what is. If enough people do it, the future is going to look pretty bleak though. If I knew for sure that financial apocalypse would soon be upon us, I'd certainly cough up a one-ounce gold coin to buy a year's supply of food. Under no circumstances would I ever cough up a year's supply of food to buy a single one-ounce gold coin though. Hey, just something to think about. Further, I actually thought *I* was bearish. The "overwhelming demand" for "6 Cans of Potato Chunks" and "3 Cans of Instant Milk" makes me look like a true believer in our long-term prosperity by comparison though. My idea of hoarding is to stock up on things I would actually prefer to eat in the future. Go figure. California is going down! The guy's an actor. He's reading a script. When they tell you not to panic, that's when you run! Generally, that's REALLY good advice. However, here we go again. It's just a movie. The 2012 scare will no doubt end just like the Y2K scare did... with a whimper. Well, almost a whimper. It isn't like our economy has actually prospered over the last 9 years. Come to think of it, who am I to heckle? It isn't like I'm not hoarding. It isn't like I'm not a believer in the "California is going down" theory. Gross noted the downturn in fortunes of "once-golden" California, including a 12% unemployment rate, near a national high; the country's lowest bond rating; poorly rated schools; jammed freeways and what was a $26 billion budget deficit resulting from laws shaped from an outdated democratic system. The Windy City, considered a favourite to be one of two finalists, mustered only 18 of a possible 95 votes. In the end, Rio de Janeiro prevailed with 66 votes to Madrid's 32. Where was the governor of Illinois when we needed him? Impeached? Convicted? Removed from office? Prohibited permanently from holding any future office of honor or trust under the convicting State? Indicted by a federal grand jury? Inquiring minds want to know! The effort and energy needed to make the president and first lady's quick trips to Copenhagen possible could be considered Olympic-sized by some estimates. The approximate cost of flying Air Force One round trip for 18 hours calculates to more than $1.2 million -- roughly $67,000 per hour. The estimated greenhouse gas emissions of Air Force One for that trip amount to more than 1 million pounds of carbon dioxide. Compare that to a roundtrip on Amtrak from New York to Washington D.C. emits 220 pounds of carbon dioxide. The president's trip is the equivalent to 4,500 of those roundtrips. The Boeing 757 the first lady rode separately emits nearly 374,000 pounds of carbon dioxide. Those figures do not include the operational costs or emissions of the several passenger and cargo aircraft that accompany Air Force One with staff and equipment. Ever heard of carpooling? Seriously. We elected you to be stewards of our money and all we got was 1.4+ million pounds of carbon dioxide, a bill for $1.2+ million, and this lousy T-Shirt. Two economists, Professors Emmanuel Saez and Thomas Piketty, developed a method for measuring income inequality using IRS data, which avoided the problems inherent in using Census Data. This data was recently updated in response to the IRS release of 2007 information, and found that: Economic inequality in 2006 was, by some measures at the highest levels, ever found in the data available for the past 95 years. In 2007, these same measure showed a further jump further bringing America to it it’s highest levels of economic inequality in recorded history. Deep down, we know that income inequality is increasing. We don't need a report or a study to confirm it. In 1928, economic inequality was near today’s levels. For what it is worth, 1928 was not a great moment in time to be taking on extra investment risk. I am a big believer that income inequality and Great Depressions go hand in hand. Long-term economic stability cannot occur if poor people keep getting poorer while rich people keep getting richer. If nothing else, at some point there won't be anyone left to shop at this country's many malls. NEWPORT BEACH – Vandalism continues to plague an abandoned shopping center in one of Orange County's most luxurious stretches of real estate, and the property owner's latest attempt to control the problem involves a whole lot of gray paint.